Directing Star Trek 3 seems like a pretty plush gig, but they’re having problems getting anyone to take the job. Roberto Orci was originally going to make his debut at the helm with the next installment of the rebooted franchise, but differences with the studio led to his ouster (we think?). Edgar Wright was reportedly offered the job, but turned it down. Paramount then unveiled five names that were are the top of their wish list, but almost immediately one of them, Duncan Jones (Moon), said he wasn’t interested. Still, the studio soldiered on, and now they’ve apparently tapped one of their top choices. Justin Lin will now direct the crew of the USS Enterprise. According to Deadline, Paramount, Bad Robot, and Skydance Productions all got together and handed the reins of the franchise over to Lin, who steps in to take over in the wake of J.J. Abrams jumping franchises to Star Wars. Lin is most known for his work in another series, that, while full of unrealistic action, is hardly science fiction. He is largely credited for reviving the Fast and the Furious movies, as he directed the last three in the family, 2009’s Fast & Furious, Fast Five in 2011, and Furious 6 last year. (For my money, 5 is by far the best.) So he definitely has some action chops, but we will have to wait and see how he does now that he’s trading in hot rods for starships. He will reportedly continue working from a script by J.D. Payne and Patrick McKay. It’s not entirely clear why Paramount and Orci parted ways, though he is still reportedly going to stay on in a producer capacity, as least as far as we know. One of the most prominent rumors indicates that, in the wake of Marvel’s success this past summer with Guardians of the Galaxy, the execs wanted to retool Star Trek to fit more in that mold. What exactly that means isn’t exactly clear, but apparently Orci wasn’t on board. Star Trek 3 could start filming as early as February of 2015, with an eye on a summer 2016 release, which will coincide with the 50th anniversary of the franchise. The plot is being kept under wraps, but there have been reports that the story picks up with the crew of the Enterprise out in deep space in the middle of their five-year mission. Hopefully that’s true, because we’ve already had two Star Trek movies that take place primarily on Earth, and that’s enough for now. Lin is a great choice as an action director, but I feel like this is going to ruffle a lot of feathers, because while there’s action in Star Trek, that’s not what makes the series so great. But that’s apparently where we’re going. What do you think? 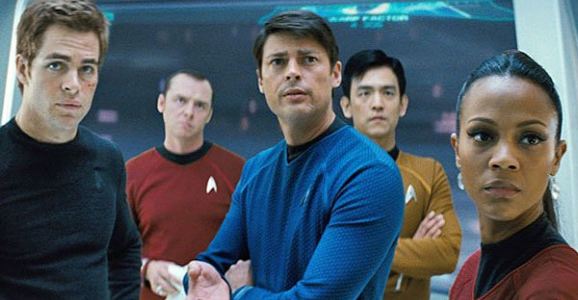 Are you excited for Justin Lin to take over Star Trek 3? At least they’re getting started and not waiting. It would be really nice if they started work on a new Star Trek TV series. I would love that! Just from reading comments here and elsewhere, I think a lot of people would prefer a new TV series to the way the movies are going. This makes me far more apprehensive than Orci did. Maybe I’ll be pleasantly surprised but if you make action movies about street racers you’re about as qualified for Trek as Nicholas Sparks. I was praying for Wyatt as I felt like he effectively did heavy hitting sociological themes in a scifi setting and with heart in his Apes film. Oh well. I like Lin as an action director, he’s well suited to crazy car chases and drag racing, but while those things are fine, they’re not necessarily what I want out of a Star Trek movie. Maybe he’ll surprise us, but I feel like we know what we’re getting with him. We’re finally going to hear The Enterprise make tire peel out sounds in space. Apparently Joe Viewer STILL don’t understand basic Science. No sound in Space. At least they tried in the 50’s with Destination Moon and the 60’s with 2001. You ask any starship captain, any real starship captain. It doesn’t matter if you can nay push the engines any harder, warping is warping. Sweet Lord Paramount. Star Trek is a responsibility that needs careful handling, not profiteering and bafoonery. Revel and take pride in the fact that this wasn’t just dang fine TV, it was also a catalyst of new thought that you should be proud of. This silly little show opened the minds of scientists towards concepts that today we take for granted as well as huge sums of money being invested into tomorrow’s world(s). This silly show also helped usher broader racial and gender acceptance, which was no small feat by any standard. This show is a legacy, please regard it as such. JFC. This terrible news. Trek meets the cartoon stupidity of The Fast and Furious franchise? The Abrams haters might as well give up on it right now.